Lua error in Module:Location_map at line 488: Unable to find the specified location map definition: "Module:Location map/data/Spain Cantabria" does not exist. 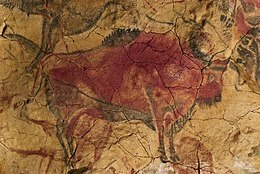 Altamira (Spanish for 'high view') is a cave in Spain famous for its Upper Paleolithic cave paintings featuring drawings and coloured paintings of wild mammals and human hands. It is located near the town of Santillana del Mar in Cantabria, Spain, 30 km west of the city of Santander. The cave with its paintings has been declared a World Heritage Site by UNESCO. McNeill, William H. Secrets of the Cave Paintings, The New York Review of Books, Vol. 53, # 16, October 19, 2006. Pike, A.W.G. et al (2012). "U-series dating of Paleolithic art in 11 caves in Spain". Science 336 (6087): 1409–1413. doi:10.1126/science.1219957.